Ah Las Vegas. The Entertainment Capital of the World. Or so they call themselves…loudly, and often! At 43 years old I had never been, so it remained a mysterious, glittery oasis in the Nevada desert. My brother and brother in law went two/three times and year, but as a single mom with young kids, dashing off to Vegas was just not in the job description! But then, my baby brother turned 40!!! That was certainly reason enough to head to Sin City, right?? Plus, my kids are older now, easier to skip out for a few days and not be worried that they will re-create Lord of the Flies in my house (ok, mostly not worried!). So even though I am totally a “Type A” planner, I had never been and M & P had been a bazillion times so I left the planning to them. Plus, as MLife members, they got all sorts of perks and free offers so I was really just tagging along for the ride! With the deals they got, the only real expense was going to be airfare and fun money. My next course of action was to beg, borrow and steal any and all airline miles I could find to get me to Vegas. Fortunately for me, I have family members that can really rack up the miles, so I was able to join M&P in First Class!! It would have been truly embarrassing to be sitting in the back waving to them up front! You will be happy to know that my bag was safe & sound, and accounted for…IN SAN FRANCISCO!!!! And while I am sure that it is lovely in San Fran, it was not where I was. So the customer service person arranged to have my bag delivered directly to our hotel as soon as it got back to Vegas so off to the hotel we went…in a stretch limo named for some artist. The Bellagio names all of its limos after artists. One day you might be in the Michelangelo, the next day Picasso or Cezanne, etc. 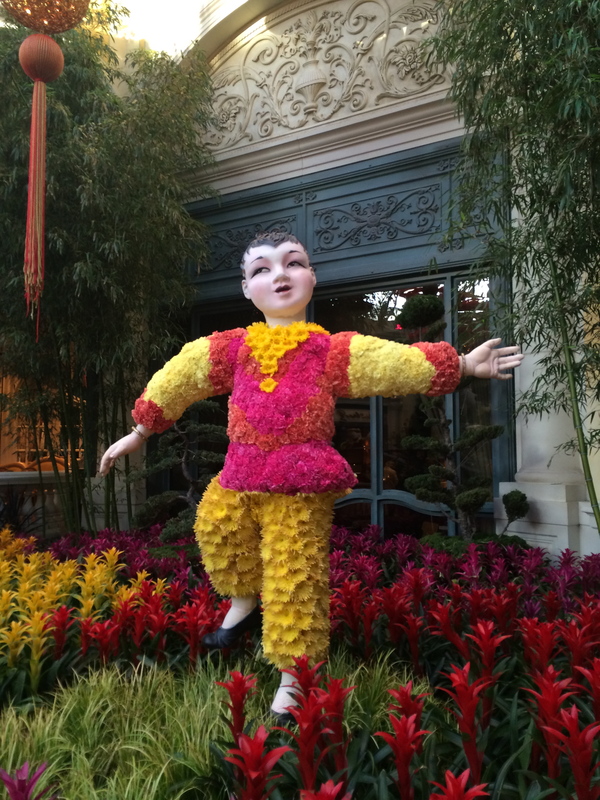 Walking into the Bellagio is an experience itself. The lobby is stunning with its glass chandelier/sculpture “Fiori Di Como.” It is made up of 2000 hand blown glass blossoms and it is absolutely incredible. All you have to do is see how many people are stopped in the middle of the walkway looking up to know how special it is. Also, as it was January, the lobby was decorated for Chinese New Year. It was pretty awesome! With the possible exception of Disney, no one can take a theme and run with it like Las Vegas, but no time to stop and stare, we have a suite to check in to! Bellagio has two areas for check in (heck, maybe more if you are checking into the Villas) one for regular guests, and one for VIP’s. We headed straight for the VIP area. Don’t judge…they have cookies! Our room was not ready yet, but no biggie…I didn’t have any luggage to worry about anyway!! Off to the casino floor! 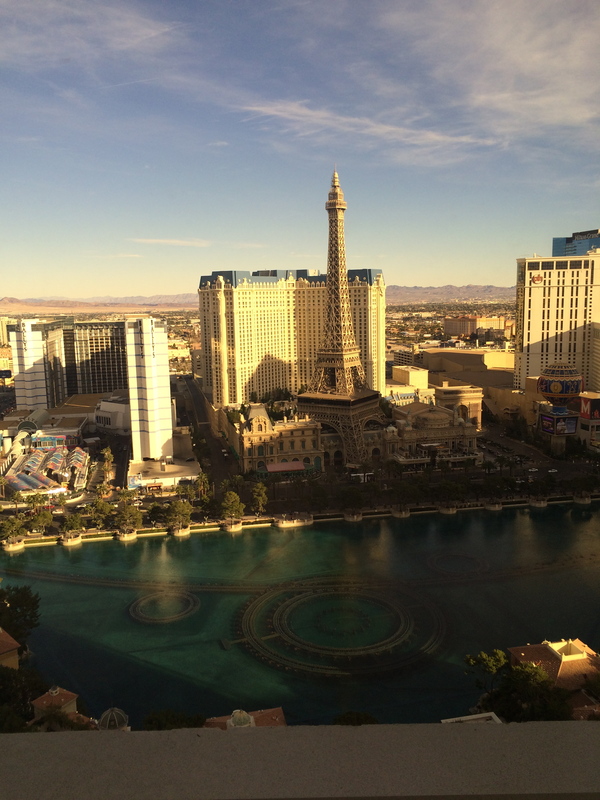 We wandered around the casino for a while as I tried to take it all in…as a mom to two boys, I am used to a good amount of noise, but the bells, whistles flashing lights and cheering that happen on the floor of a Las Vegas casino was really something. Fortunately, our room was ready in short order and up we went. If you stay at the Bellagio, a room on the front of the hotel, close to the center and as high as you can get is absolutely the way to go. It is a perfect place to watch the fountain shows and gives a great vantage point over all of the strip. The fountain shows run every 30 minutes during the day, more often at night. The television plays the music so even if you can’t hear very well through window (what, you aren’t staying in the Lakeview Suite with the balconies? Yeah, me neither! ), at least you can turn on the TV and listen along…its surprisingly well synced up! I did video one of the shows so when we get there, you can see for your self! But for now, all we did was find something to eat and go to bed. It had been a long travel day.